We have innovatively combined the use of air-cushion technology with our standard belt conveyors to create The Belt Conveyor. Our customers can now benefit from a high-capacity conveying system that offers minimal equipment wear and very low operating costs as a result of reduced friction in the conveying line. 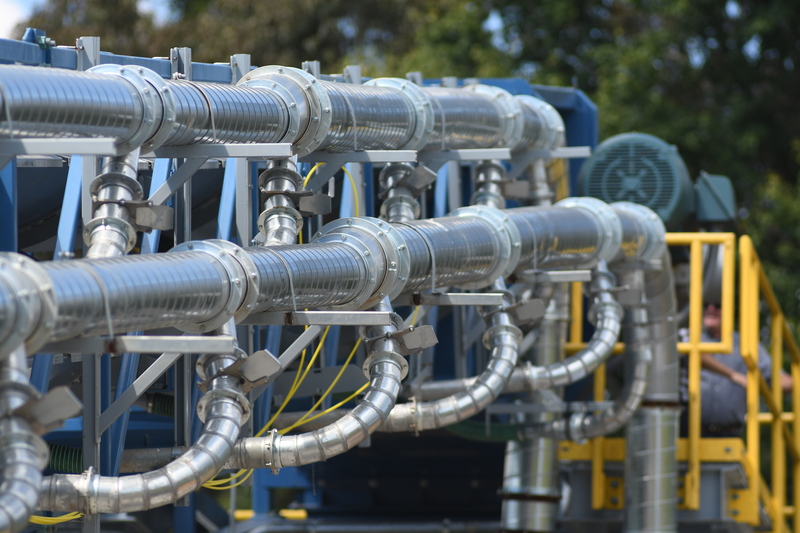 Like the Tubulator, our air-supported belt conveyor has a totally-enclosed design that protects the environment from dust emissions and reduces any material losses to a minimum. 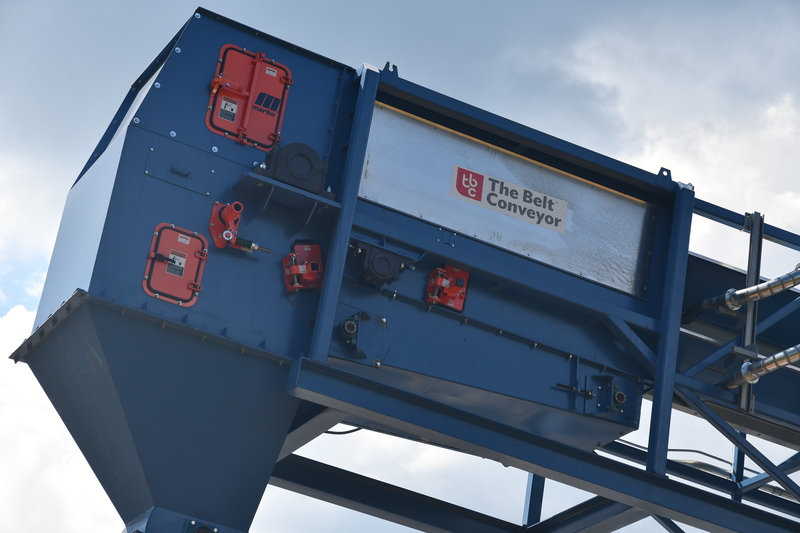 Rather than using a pipe as the key containment method, the belt conveyor uses a formed pan to support the belt, with a fully flanged cover over it to make it dust tight. The belt can comfortably conform to the profile provided by the pan without the added stretching needed to travel through a pipe. The shape of the pan also mimics the geometry of a 35-degree idler conveyor, but without the rollers, therefore it still meets the industry-standard calculations for the USA’s Conveyors Equipment Manufacturers Association (CEMA). The magic of the air-supported belt conveyor is in the way the air is delivered to support the belt. Each 3m section has access to a common header of pressurized air with air pressure sensors and flow meters installed to monitor it. Under the carry-side pan, is a corresponding 3m-long pressurized air enclosure system, otherwise known as a plenum, which delivers air through holes at just the right pressure and airflow to lift the belt for essentially frictionless travel. Independent plenums of air can be individually set for each installation, matching the delivery of air for each application precisely and accurately. This patented air delivery method allows the Bruks air-supported belt conveyor to carry a wide variety of materials with diverse physical properties. In our Tubulator conveyor, pressurized air is generated over the length of the conveyor by fans located at every 250ft (80m) interval. The Bruks air-supported belt conveyor offers an extremely smooth ride surface, eliminating the bumpiness characterized by traditional idler-supported belt conveyors. Therefore, material is discharged in exactly the same condition as when it was loaded onto the belt. Idler belt conveyors have rollers spaced at 1.2m intervals, generating movement in the belt. The shaking that occurs over any distance encourages smaller particles to sift between larger ones, stratifying the load on the belt, which can have a significant impact on many downstream processes. By the time material is discharged off the head pulley into the following chute the fines can be heavily concentrated at the surface of the belt, making belt cleaning more difficult. 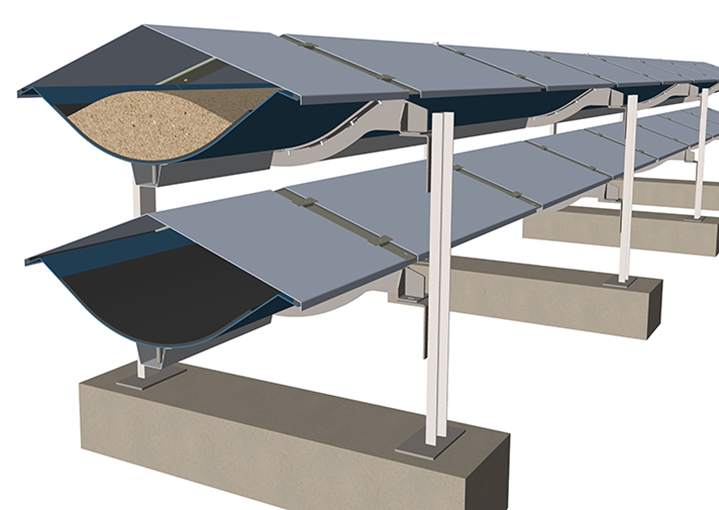 Our air-supported belt conveyor eliminates stratification. 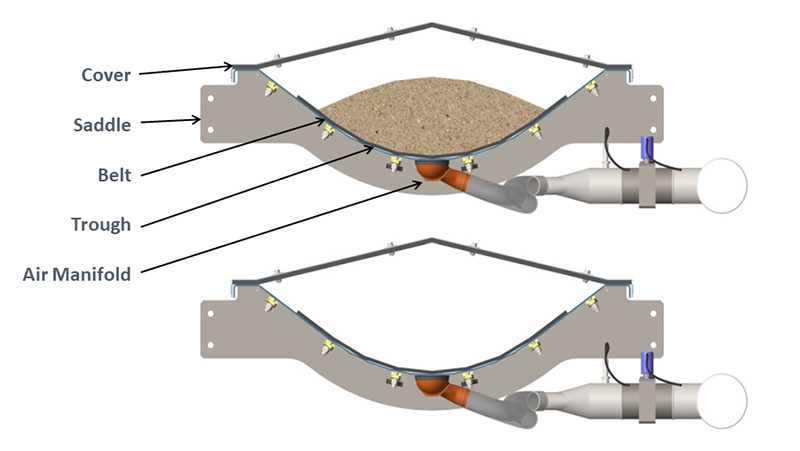 The Bruks belt conveyor, like the Tubulator, uses a modular design. Its 3m sections consisting of carry side pan, return side pan or rollers, covers, air supplies and supporting structures, form the basis of the conveyor. If the conveyor is fixed to the floor or ground, simple support legs are used. If it occupies and elevated position, a square truss surrounds the conveying elements and provides optimum strength and rigidity, matching our Tubulator’s minimalist support bent and tower requirements. If desired, a walkway can be added for access and observation. Common to all belt conveying methods, the head section contains the drive unit as well as multiple belt scrapers and cleaners. Depending on application requirements, the tail section can have impact beds or plates. In compliance with CEMA guidelines, tensioning on short belts is achieved by screw adjustment and gravity take-ups for longer conveyors. Typical belt conveyor third-party components like weigh scales, metal detectors, magnets, and material sensor areas, for analyzing moisture content, for example, can all be accommodated.